If you have an iOS® or Android™ device, you can download Iowa State Bank’s Mobile App. Download the Mobile App today for your smartphone or tablet device* – it’s convenient, it’s secure, it’s the latest technology, and it’s free! Our Mobile Banking App provides a multi-layered authentication and layered security technology to help protect against fraud. In the event you lose your device – contact Iowa State Bank to have the Mobile App deactivated on the lost device. *If not a current Online Banking customer, please click ‘Enroll Now’ located in the upper left hand corner of the page. Search using the key words: Iowa State Bank Clarksville to quickly locate our Mobile App shown below. 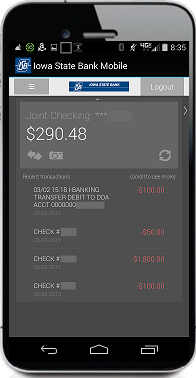 See the Mobile Banking App Information Sheet for a printable version.